I love Barbara Cameron’s books. It’s not just a romance story. There are always elements of mystery included in her writing. In this story, the first in the Quilts of Lancaster County, I found the characters to be very believable and yet leaves you with just enough questions to make people like me want to research more of the Amish lifestyle. The difference between the two worlds, that of the Englisch and the Amish is well defined yet the author shows us the parallels between the two cultures. The ending of the book was satisfying yet left you wondering what was going to happen next. The reader doesn’t have to wonder long because they can find out when they red the second book in the series, “A Time to Heal”. 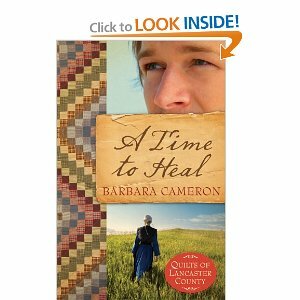 A Time to Heal is the second book in the Quilts of Lancaster County series. We are reacquainted with Jenny, Matthew, Phoebe and Hannah in this book. This second book once again brings us into the parallelism of the two worlds, the Englisch and the Amish. Chris Matlock follows Jenny to Lancaster County looking for peace and finds love and trouble. The turmoil he feels is prevalent throughout the entire story and the reader can’t help but feel sorry for him. At times though I thought he was so self-absorbed in his own problems that needed to be shaken. I loved the way it has a happy ending. What I enjoy most is the theme of forgiveness that runs throughout the book. One thing I would love to see in the third book is more backstory on Bishop Josiah. In both books he is seen as a grouch, overly protective bishop. We get a glimpse at the end of the first book into his heart and find he does have a soft side. Then in book two we see the old Josiah back. I would love to see a book written about him. His character felt almost like a loose end. In book two we are also being set up for book three by watching the change in Phoebe. I look forward to seeing where the third book takes us. These whole series is a must read for Amish fans.